PORT OF SPAIN, Trinidad – Contrasting half-centuries from Odean Smith and Tevin Imlach were the cornerstones for a successful run chase that carried WINDIES “B” to a three-wicket victory over defending champions Windward Islands Volcanoes in the 2018-19 WINDIES Super50 Cup on Monday here. Smith cracked seven fours and four sixes in the top score of 64 from just 34 balls to get the run chase back on track and Imlach held the innings together with an unbeaten 57 from 110 balls, as WINDIES “B” completed their second victory of the Tournament and the Volcanoes slumped to their third straight loss. In the other Group “A” contest: Raymon Reifer hit his second straight half-century to fortify the Guyana Jaguars’ hold on the top spot with a four-wicket victory over Canada. At Queen’s Park Oval: Chasing 228 for victory, WINDIES “B” endured a horrific start, losing openers Keagan Simmons and Kimani Melius for ducks without a run on the board in the space of three balls inside the first two overs. They stumbled to 70 for five in the 24th over before Smith came to the crease and changed the direction of the innings with his enterprising batting to dominate a stand of 80 for the sixth wicket with Imlach. Left-arm spinner Larry Edward bowled him in the 34th over and also removed Alzarri Joseph cheaply in the 38th over, as he finished with 4-47 from his allotted 10 overs to be the most successful Volcanoes bowler, and WINDIES wobbled further on 166 for seven. Jeavor Royal however, entered and lashed five fours and one six in 44 not out off 38 balls to control an unbroken, eighth-wicket stand of 63 with Imlach that carried WINDIES “B” over the finish line with 19 balls remaining. Earlier, Kavem Hodge, whose 2-15 from 10 overs in the WINDIES “B” chase made him the pick of the Volcanoes’ bowlers, started the day with a resolute 78 off 126 balls that included four fours and one six. He teamed up with WINDIES Under-19 World Cup captain Emmanuel Stewart and all-rounder Ryan John to revive the Volcanoes’ innings with two successive half-century stands, after the reigning champions slumped to 40 for five in the 12th over. Stewart made 56 from 71 balls that included six fours and one six in a 95-run, sixth-wicket stand and John supported with a run-a-ball 44 to put on 76 for the seventh wicket. Joseph was the most successful WINDIES “B” bowler, taking 3-54 from 10 overs, and Chemar Holder, his former WINDIES Under-19 World Cup-winning new-ball partner, grabbed 2-37 from eight overs. At the Brian Lara Cricket Academy: Reifer hit five fours and one six in an unbeaten 61 from 73 balls to collect his third half-century of the Tournament, as the Jaguars successfully chased 206 for victory to log their fifth straight win. He shared 79 for the fifth wicket with wicketkeeper/batsman Anthony Bramble to get the Jags back on course, after they stumbled to 96 for four in the 20th over. 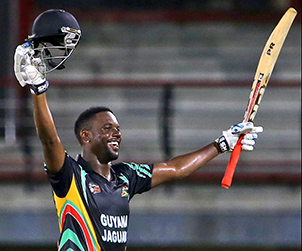 After Bramble, whose 44 came off 40 balls, and Ricardo Adams were dismissed in the space of seven balls, Reifer found Romario Shepherd a steady ally and they ushered the Jaguars to victory with 65 balls remaining. Off-spinner Nikhil Dutta bagged 3-41 from 10 overs for the Canadians. Nitish Kumar led Canada’s batting with 51 off 72 balls and there were a handful of other batsmen that got starts without carrying on, as the North American side reached 205 for seven off their allocation of 50 overs. The most stable period of for Canada came when Dutta and his captain David Jacobs added 62 for the seventh wicket. Jacobs was not out on 34, Ravindu Gunasekera made 34, Dutta got 29 and Navneet Dhaliwal added 20. Veerasammy Permaul took 2-26 from 10 overs to lead the Jags’ bowling.